Wow, it happened again! Slow Stitching sold out in record time… You guys blow me away each year. I will start a waiting list for anyone interested. Send me an email to info@agatheringofstitches.com. Last year there was certainly movement on the list, so give it a shot…! Would you like to slow down and spend some quality time with your stitching? Maine is a beautiful place to turn down the volume, shut off the email, leave the phone in your room, and spend some time with a needle and thread. 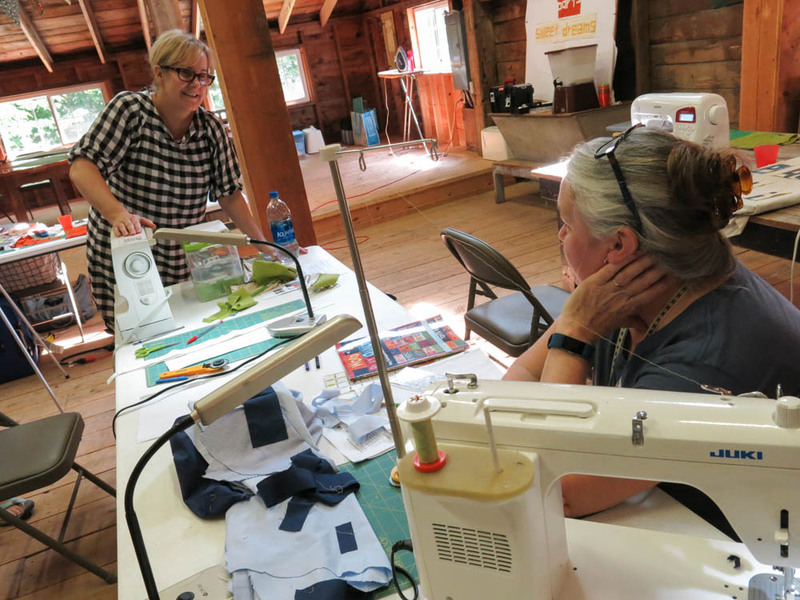 This year three world class sewists and makers: Chawne Kimber; Tara Faughnan; and Kim Eichler-Messmer, will share their time, their stitches, their color, and their spirit with you for five days in Washington, ME, come August. ~Chawne is an integral part of the Slow Stitching retreat, having been a founding instructor. This year she returns to teach pieced letters. If you've got something you want to say in your quilts, Chawne will give you the tools to use your words in your Making....! ~Tara will be teaching hand stitching a six pointed star. You’ll learn how to sew a 6 pointed star, and master tricky techniques like y-seams and twirling seams. With Tara you will cover the basics of hand sewing, including creating templates and marking fabric for sewing, as well as color choices and the importance of value for creating a successful design. ~Kim is returning to teach natural dyeing! Dyes made from plants and insects have been used to decorate textiles for thousands of years, but with the invention of synthetic dyes, a lot of information on natural dyeing was lost. Much of the information available now can be confusing, intimidating, and sometimes wrong about how to use them. Focusing on cellulose fibers such as cotton and linen, she will demystify the process of creating beautiful colors including sourcing materials, setting up a dye studio, proper fiber preparation and mordanting. You’ll explore various dye techniques such as immersion dyeing, shibori, and bundle dyeing. There will be plenty of hands on time for practice and experimentation and time for discussion and questions. Tara is a professional freelance textile designer and quilter living and working in Oakland, CA. She started to quilt around 2001 or so, using as her guide a reprint of the 1931 edition of 101 Patchwork Patterns by Ruby Short McKim. She had no idea such things existed as rotary cutters, plastic templates, freezer paper etc. 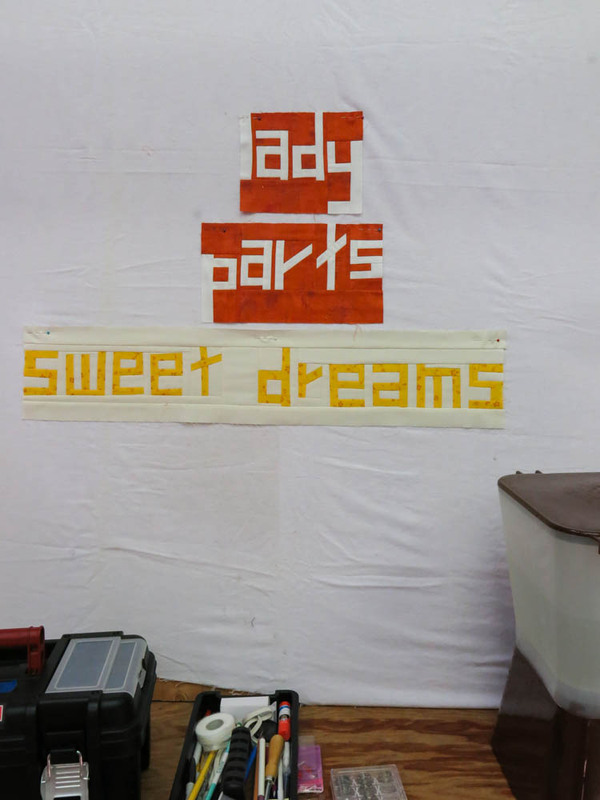 She spent many happy weeks tracing around cardboard templates and cutting out pieces with a pair of scissors. When she told a woman at her local quilt shop how her first quilt was going, she promptly introduced her to the wall of rulers, cutting mats and gadgets. Thus began a long love affair with Tara’s faithful rotary cutter. She still has her, she's worn down and a bit squeaky, but she fits her hand like they were made for each other. Somewhere along the way, Tara’s love of quilting led her to school and on to a career in textile design, with clients including Michael Miller Fabrics and Pottery Barn Kids. She find inspiration in forms, shapes and the place where 2 seams meet. Color interaction is the key inspiration that drives her. It's that intuitive moment when you put two colors together, and then two more, and two more after that that she focuses on. The explorations are endless and she strives to try to walk the line of discomfort and still make everything work together as a whole. Tara draws a lot of inspiration from the simple bold geometry of antique quilts, the gorgeous bright colors from textiles around the world, and freedom and spontaneity found in unconventional and improvisationally pieced quilts. When she looks at her current work, she sees all 3 of these aspects represented. Tara likes to use simple geometry, complex color interaction and find the line that exists somewhere between harmony and discord. If your time in Maine opens up even more pathways to creativity, our good friend, Katherine Ferrier will offer up her workshop, Making, Being, and Being Made, Contemplative Writing for Makers, again this year. This mini-workshop is entirely optional, and the time for it will be decided on site by all who are interested. Katherine Ferrier is familiar to those who have spent any time at an AGOS event, but for those new to this forum, she is a poet, dancer, maker, teacher, curator, and community organizer. Her research grows out of a deep practice of paying poetic attention to the world, and lives in the intersecting communities of movers, makers, writers and activists. A self-taught quilter, she has improvisationally designed and constructed nearly 100 quilts, drawing on her studies, both formal and independent, of movement, poetics, painting and architecture, among other forms. She is the Director of the Medomak Fiberarts Retreat in Washington, Maine, and has recently expanded her fluency as a maker by embracing felting, weaving, and natural dyeing. She regularly teaches and performs throughout the US and abroad, and believes in patchwork as a radical practice of being patient, saying yes, and making space for everyone at the table. Registration includes lodging in a cabin with one roommate, all meals, and all instruction for five days. The cabins are rustic and spare, but modern and comfortable. Please do note that many of the cabins are in the woods, and require an uphill walk. If mobility is an issue for you, please contact me when you register. There is a limited number of private cabins available for an extra $200. Let me know quickly if this is your preference. If you are coming with a friend, just let me know when you register and I'll put you in the same cabin. We can accommodate most dietary restrictions within reason, just alert us to your needs in advance. Our fabulous massage therapist, Lori Cressler will return to further assist in slowing us all down.... Massages can be scheduled upon arrival. The food at camp is simple, wholesome, and satisfying. Please notify me of food allergies, or if you are Vegetarian (specify if you do/do not eat dairy, eggs, fish, etc…) , but we suggest that unless you have a specific condition, you will find plenty to nourish you during your time at camp. Medomak Retreat Center is in Washington, Maine, about 80 minutes from the Portland airport, 3 hours drive from Boston, 7 hours drive from NYC. Washington is only 30 minutes inland from Camden. The campus has 250 acres of blueberry fields and forest, with trails for hiking, tennis courts, and lakefront where canoes and kayaks are available. The cabins are clean but spare and you have two choices of arrangements. Share a cabin with one other for the $1,500, or if you'd like a more intimate experience pay another $200 for a private cabin, just let me know your preference in the form and I will adjust your registration fee. Do note that there is a limited number of private cabins available. In order to give you plenty of time to check, and double check, your schedule, and confer with partners, bosses, children, parents, and pets, to make sure this will work for you, I delay the opening of registration. This year registration will open Sunday March 3rd at 3:00pm EST. I will send an email to my newsletter group when registration opens. If you want to be notified when registration is open, you should sign up for the newsletter, spots have gone quickly in the past….. You will need to pay a non-refundable deposit to register, and then arrangements can be made for how to pay your balance.